That’s the situation we happily found ourselves in last weekend when we headed out on our most recent shopping excursion. Between our booth at the Lucketts Spring Market and the many visitors to our Leesburg store over the past few months, we had an urgent need to restock our inventory. What better reason for a road trip? Last year we traveled to Kentucky, to take part in the World’s Largest Yard Sale (WLYS). This event is held the first weekend of August along US Route 127 from Alabama to Michigan. Rather than wait another month for WLYS, this time we stayed closer to home, heading to North Carolina for the US 301 Endless Yard Sale. This sale is a new addition to this growing practice of communities organizing “linear” yard sales where businesses and residents participate by having yard sales, sidewalk sales and special promotions along a well-travelled thoroughfare. Established in 2013 along US Route 301 in Johnston County, the event was so successful that it expanded this year to cover three other North Carolina counties, Halifax, Wilson, and Harnett. We based ourselves in Smithfield, North Carolina, the county seat of Johnston County. 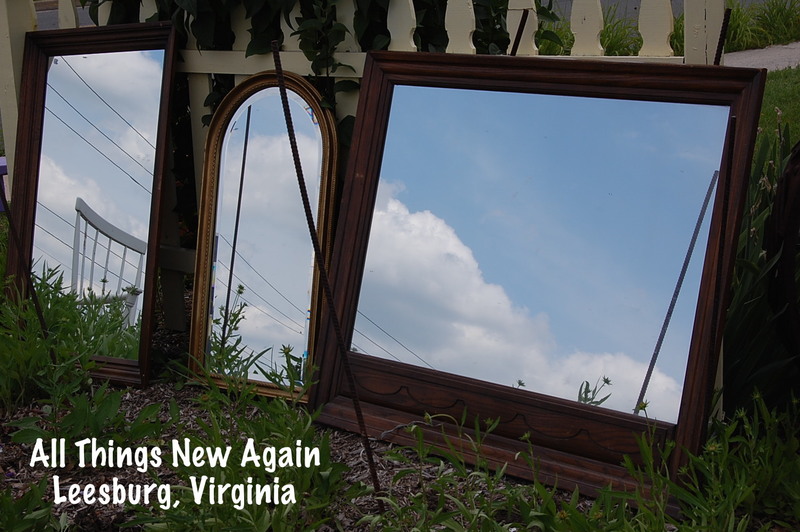 With a drive time of only 4 1/2 hours from Leesburg, it was much easier to reach than the towns along US Route 127. For those of you who frequent Interstate 95, you might recognize Smithfield as the home of Carolina Prime Outlets and the Ava Gardner Museum. Smithfield can boast more than that, however. There is a host of outdoor recreational activities in the region, a surprisingly vibrant arts scene, civil war history, museums, wineries, and, this being North Carolina, auto racing. But of course, we were here to shop, and Johnston County did not disappoint. Local businesses and vendors turned out for this year’s sale. There were good selections of all types of furniture, china, glassware and other collectables. 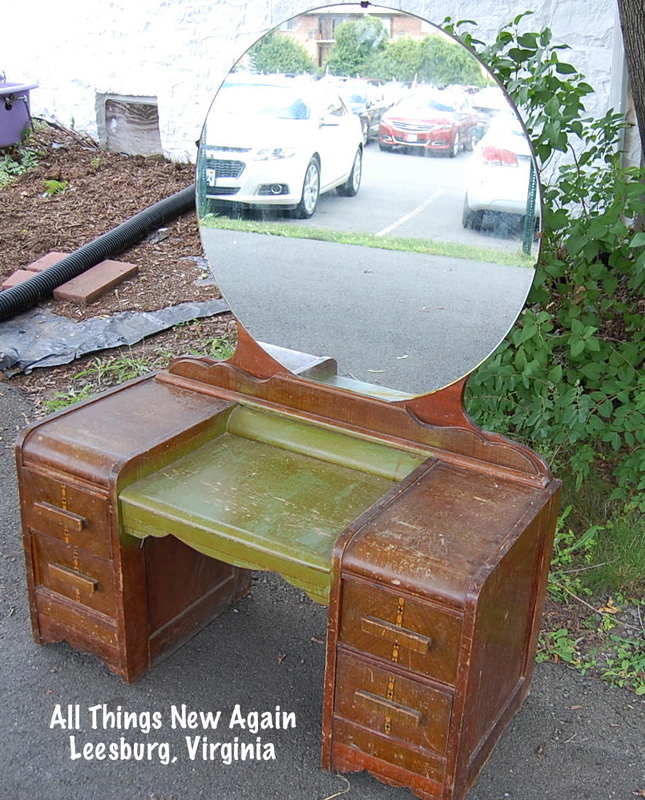 We found some wonderful buys, including cute tables, unique vanities and several lovely dressers. We were happy to discover that our shopping would not be limited to vendors only there for the yard sale. There are many antique dealers and flea markets with a permanent, year-round presence as well as some wonderful boutiques and a quaint, old-fashioned drug store. All this shopping made us hungry, of course. Since we were in North Carolina, we wanted to taste some authentic North Carolina-style barbecue. North Carolina is actually known for two distinct types of barbecue: Eastern style, which uses a vinegar-based sauce on meat from the entire pig, and Lexington style where catsup, vinegar and pepper comprise a sauce that exclusively accompanies pork shoulder meat. The Eastern style predominates in Smithfield. There were several great barbecue places, but our favorite was Smithfield Chicken ‘N Bar-B-Q. Established in 1964, this restaurant has now expanded to 30 locations in North Carolina, but we ate at the original one located right on Route 301 in Smithfield. Their tangy sauce was a perfect accompaniment to the tender pork meat, paired with creamy coleslaw and potato salad. If barbecue is not your thing, try the fried chicken. The crispy exterior kept the meat moist and juicy, and the hushpuppies were simply outstanding. If you enjoy dessert, save room for the banana pudding. Don’t be put off by the single serve plastic containers. The smooth pudding’s intense banana flavor is the perfect way to end a traditional North Carolina meal. (Plus it’s easy to split a single serving)! All in all, we enjoyed our trip to the Tar Heel State very much. I will admit I was not sure how this new North Carolina yard sale would stack up, especially against the WLYS, which has been made famous through programs on HGTV, but we found friendly people, a great selection of merchandise and some terrific food. We are already looking forward to heading back! Here are photos of a few of the great items we brought home from North Carolina. 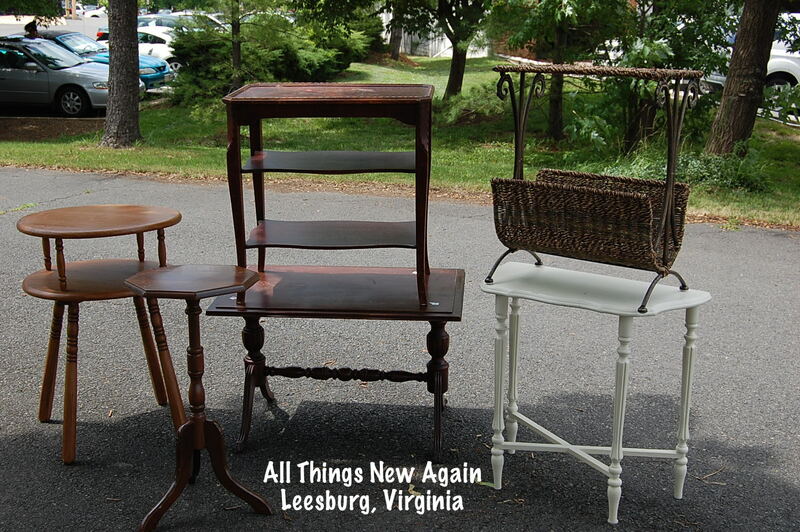 Stop by All Things New Again this weekend to see it all! We are open Friday and Saturday 10 am to 5 pm. We call this Richard’s Dresser because we bought it from a guy named Richard. 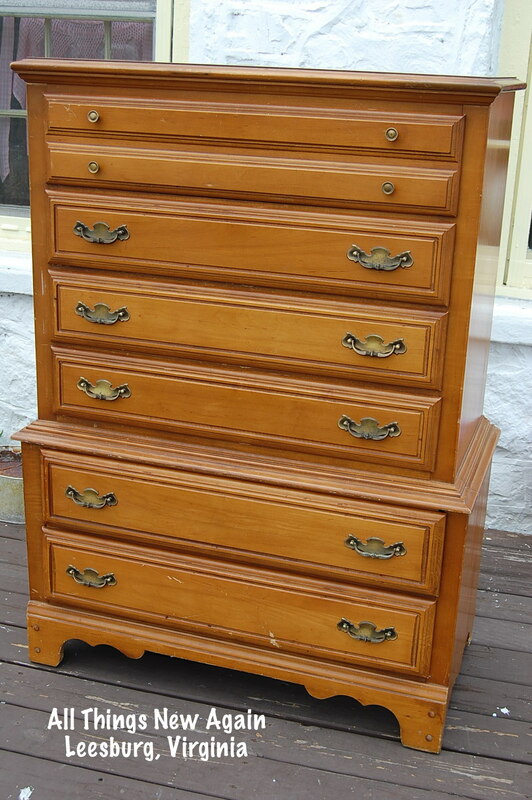 This is a sturdy and elegant piece that will be stunning with an American Paint Company make-over. Measures: 51 1/2″ high x 18 1/4″ deep. It is 38″ wide at the bottom part and 36″ wide at the top. Priced: $125 as is — or — $499 for us to custom paint it. This vintage art-deco waterfall-style vanity once belonged to Sarah and Teena. (I know this because they carved their names into it!) Yes, this piece needs a lot of TLC, but it will be beautiful again once it is sanded and painted. If you are up for the challenge, this piece is $199 as is. Or we will do the work for you in your custom colors for $499. Desk measures: 23″ high x 44 1/2″ wide x 18 1/2″ deep. Mirror is 34″ across x 37″ high. The total height of the desk and mirror is 60″. The mirror is in fair shape, but does show some slight silvering around the edges consistent with its age. We picked up a lot of really cute little tables all along Route 301! Priced “as is” at $15 to $24, they make a great paint project for you … or we will be happy to custom-paint one for you in the colors you choose for $34 to $56 (depending on the table). Mirror, mirror on the wall … Who is looking for a great mirror to paint? (Or not paint…these three are pretty as is.) The mirror on the far left is not for sale because Courtney decided to take it home for her living room. The center mirror is $28 as is or $48 painted and that big ol’ mirror on the end is $40 as is or $85 painted. I forgot to measure, but it is HUGE and heavy! The glass on all three mirrors is in really good shape. We’re glad you enjoyed your visit, and hope you’ll join us again next year! Thank you Sarah! We had a great time and we are looking forward to returning. We just set the dates for next year – June 19-20! Awesome! Thanks for letting us know. I will put it on the calendar!